ES-Series 2” Hybrid Mid/Tweeter System. 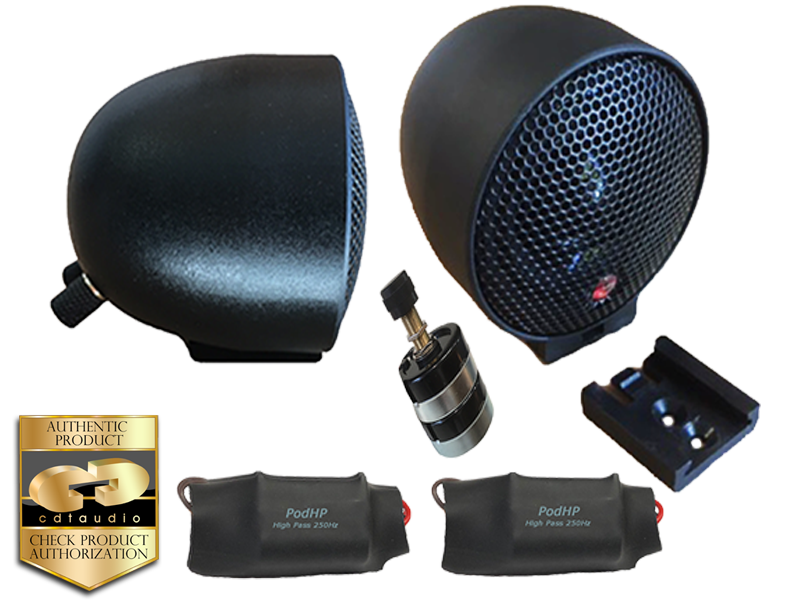 Elegant injection molded speaker pod. CDT introduces ES-020i PodX 2” hybrid mid/tweeter in special designed injection molded speaker chamber incorporating a new parametric blend in an affordable package that puts, sweet midrange with incredible detail in your vehicle locations simply and easily. Suitable for dash, door, kickpanel, rear deck installations for use in 2 or 3 way component systems or separate as accentfill system to existing component system installations. These hybrid drivers provide full, rich, extended midrange down to 150Hz up to a tweeter top end frequency of 20.000Hz. If you’re listening tastes are for superior midrange detail with a sweet and smooth upper tweeter sound, thesedrivers provide optimum extended range, wider frequency range than any other driver in the market. This NEW hybrid marvel is a unique 2” mid/tweeter, you get both mid and tweeter sound from one speaker unit. Black color is standard at no additional cost. Custom color: $25.00. Aluminum front bezel is optional: $20.00. If you wish to choose a custom color, please email color choice to info@cdtaudio after placing the order on PayPal. Ships with 3 feet speaker wire.